Medical Mystery: Why was German shepherd limping? 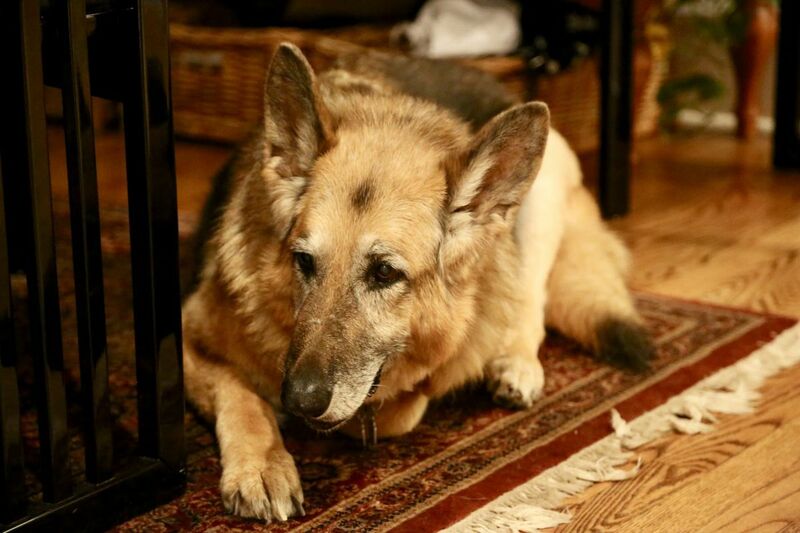 Marcie Makris, a 13-year-old German Shepherd. Marcie Makris is a 13-year-old German shepherd who suddenly became lethargic and lame on her left hind leg. Marcie was on a glucosamine supplement, but had no history of arthritis, or being given pain medication. Her exam revealed that she had a fever, was eating less than usual, and she had a large, grapefruit-sized swelling in the thigh of her lame leg, with edema in the lower part. Edema is an alarming swelling and fluid accumulation, often due to impingement— such as a mass — on the blood supply to the affected area. My concern, given Marcie's age, was that a cancerous lesion was causing the swelling. I referred her to a specialty center for an ultrasound and radiographs of her left leg. To my surprise, she did not have a tumor. So what was causing all the trouble? The ultrasound revealed she had an abscess, possibly caused by a puncture wound, to judge from a small mark on her skin. While waiting for results of a culture taken from the abscess, Marcie's care team started her on antibiotics and pain medication. She stayed in the hospital overnight, and by the next morning, her condition started to improve. A week later, her culture came back negative for bacterial growth. It was then determined that she likely had a spider bite causing the swelling and inflammation. There are more than 30,000 species of spiders, and most are venomous. Small puncture wounds are usually caused by either widow spiders or brown recluse spiders. The widow bites tend to be more painful and lead to more severe symptoms including muscle cramping, with tremors, vomiting and diarrhea. Widow bites can even be fatal. They are treated with pain medication and antivenin. Marcie did not have those symptoms, so it was assumed that she was bitten by a brown recluse spider. Typically, brown recluse bites can be itchy or blister early on, and then become more inflamed. A bull's eye lesion may result, but it is often covered by fur and missed by vets. It might be several days before the bite is obvious. Most brown recluse cases resolve within one to three weeks, with medication for pain and infection, and have a good prognosis for cure. Within two weeks, Marcie was mostly back to her normal self. Dawn Filos is a veterinarian and owner of Bucks Mercer Mobile Vet, a house-call mobile practice in Bucks County and Mercer County. She blogs at askthepetvet.com and can be contacted at Info@askthepetvet.com.